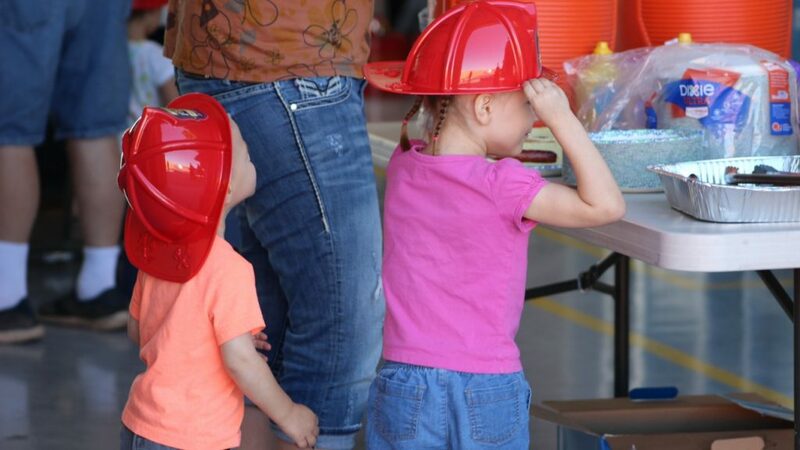 WASHINGTON CITY — Fire Station 61 was the place to be on Saturday, as more than 100 guests, firefighters and their families celebrated Washington City Fire Department’s first open house. 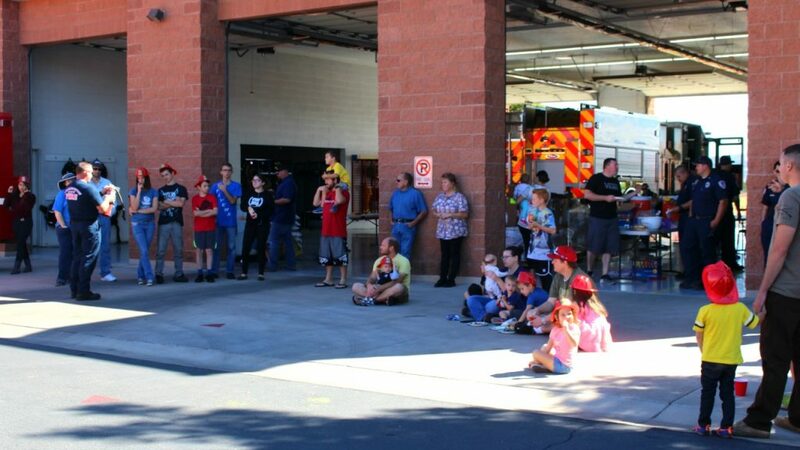 Attendees young and old alike enjoyed games, fire truck tours and safety demonstrations while eating hot dogs cooked fresh on the grill. 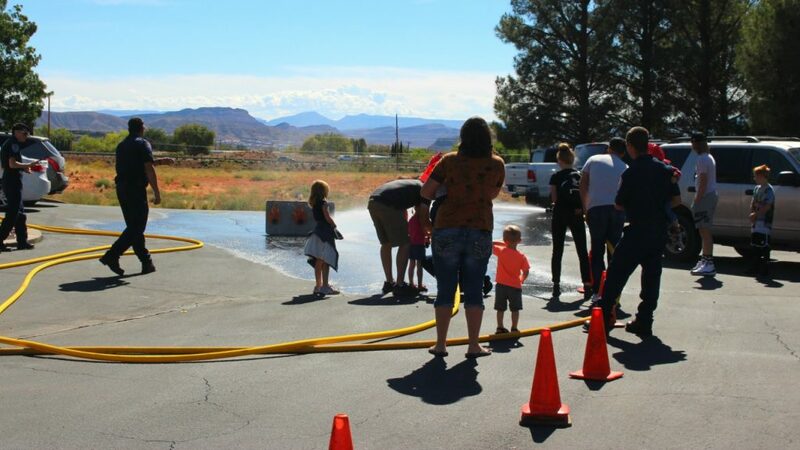 Hot dogs, chips and drinks were provided while guests participated in games and other activities geared toward fire safety and prevention, all in the spirit of fun. Bright red fire hats and toy badges were provided for younger guests. 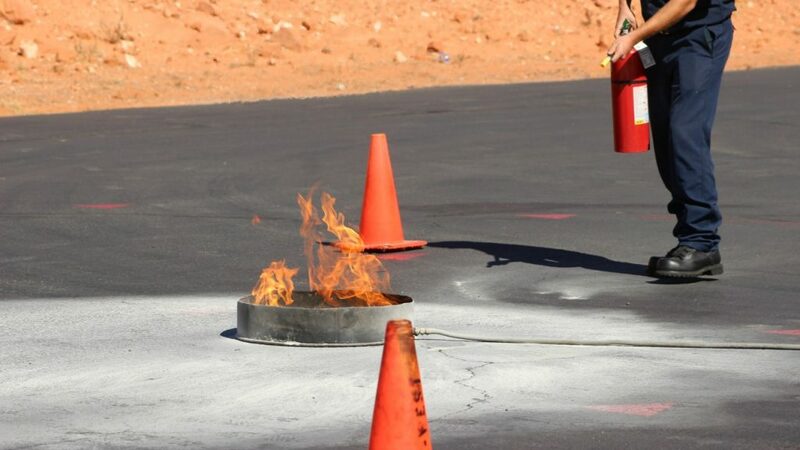 During the event, a fire was started in a makeshift burn ring to demonstrate how fire extinguishers work, where they should be placed in the home and garage, and how to effectively use them should a fire break out in the home. “Pull” the pin at the top of the fire extinguisher’s handle. “Aim” the fire extinguisher toward the fire. “Spray” the foam towards the base of the fire instead of toward the flames. 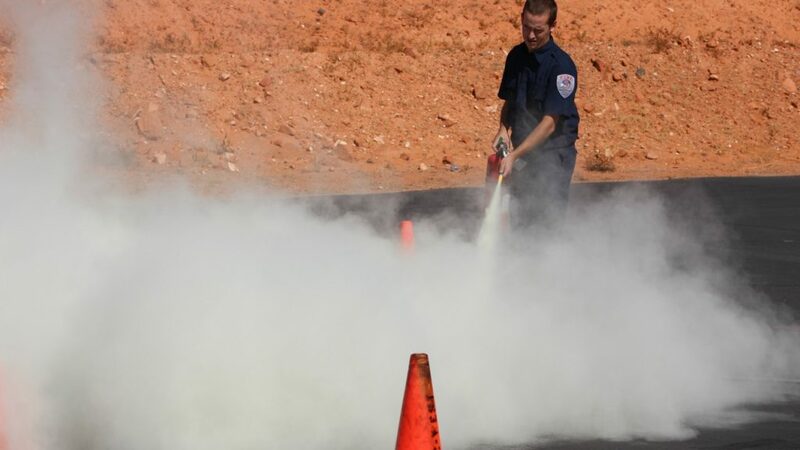 “Sweep” the fire extinguisher back and forth to cover the entire area with foam. 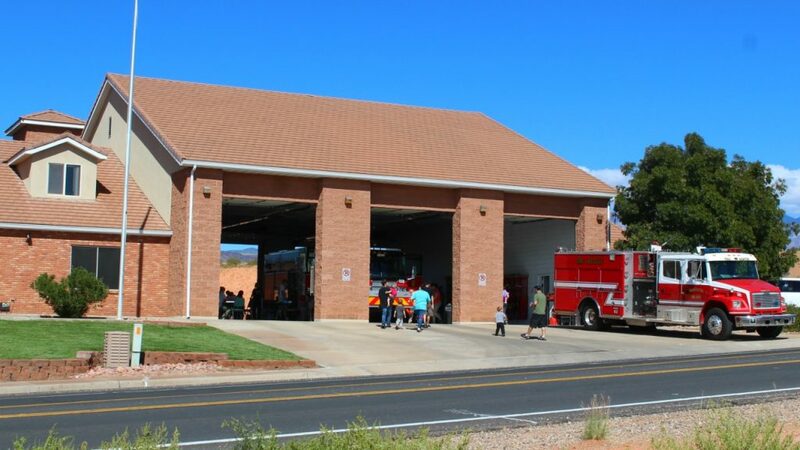 Numerous boxes were stacked in the middle of the fire station which Reyes said contained 30 new sets of self-contained breathing apparatus, referred to as SCBA’s, which provides each firefighter with state-of-the-art breathing equipment. The SCBA gear is equipped with thermal imaging technology to find victims inside of a building or other firefighters that are trapped or injured. Reyes said the SCBA’s increase safety and allow firefighters increased access into burning structures to perform rescue functions and firefighting operations, and added the new equipment was an important purchase for the department’s crew of 29 firefighters, including 10 full-time, 12 part-time and 17 volunteer firefighters. The cost for each SCBA set is $6,500, and 30 sets were purchased at a total cost of $195,000. 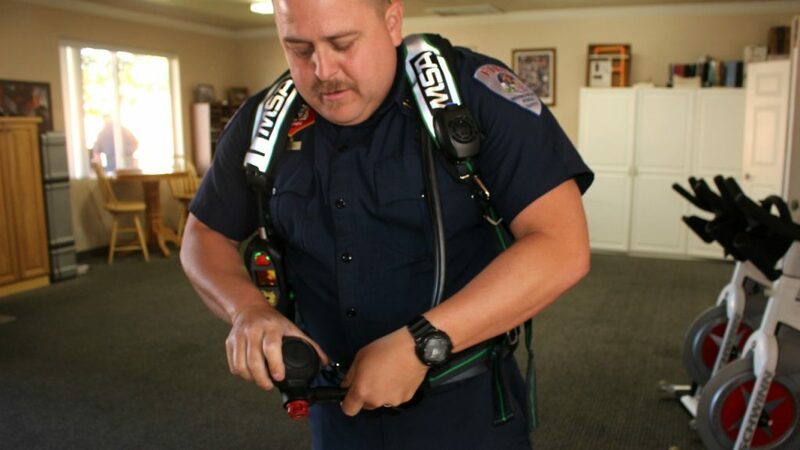 The respiratory system is both the biggest system in the body and the easiest to compromise, and to prevent contaminants from entering the lungs, the new equipment comes with a full-face mask and more effective breathing apparatus, and is equipped with personal safety alarms that activate under certain conditions automatically, even if the firefighter becomes incapacitated. The thermal imaging cameras that come with each unit can resolve one of the most significant barriers firefighters face particularly during rescue operations: the inability to see through the dense smoke created by the fire. Since the cameras use heat to create clear images, it allows the wearer to see through the smoke or other barriers that can obstruct the view. The cameras can also detect energy emitted through a door or wall, which indicates a great deal of heat coming from the other side. 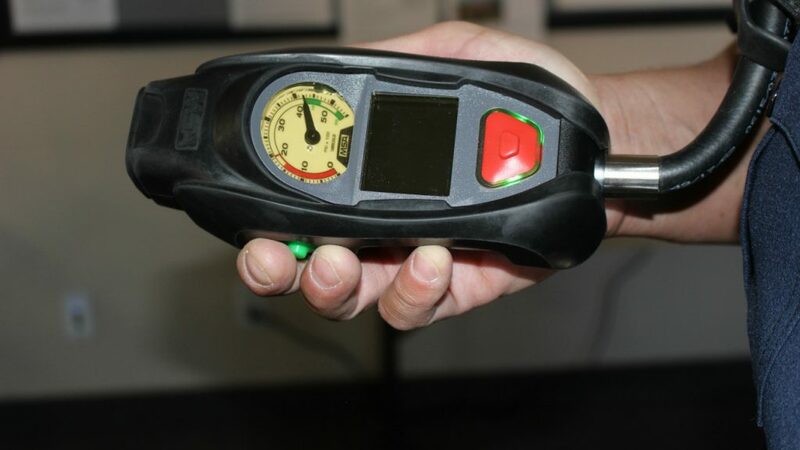 This can assist crews in detecting hot spots inside of walls that can go undetected during smoke investigations or overhaul. The cameras can also help when sizing up a fire by allowing crews to observe a fire from the exterior of the building, giving them information on the size and scope of the fire before crews have entered the structure. Additionally, the cameras also come in handy during traffic crashes or rescues that take place at night, Reyes said, using heat the cameras return clear images even when operating in complete darkness. While nothing replaces a firefighter’s senses on the ground, the support equipment can fill in the gaps that in the end can help save lives. Prior to the delivery of the new equipment, the department only had thermal imaging cameras on each fire engine, which sometimes hindered efforts when firefighters were working in homes or buildings where crews are searching for victims in multiple areas of the structure. “If we needed another camera, then we had to wait for a second engine to bring one. But now every firefighter at the scene will have one, so they can search right away, instead of waiting for equipment,” Reyes said. 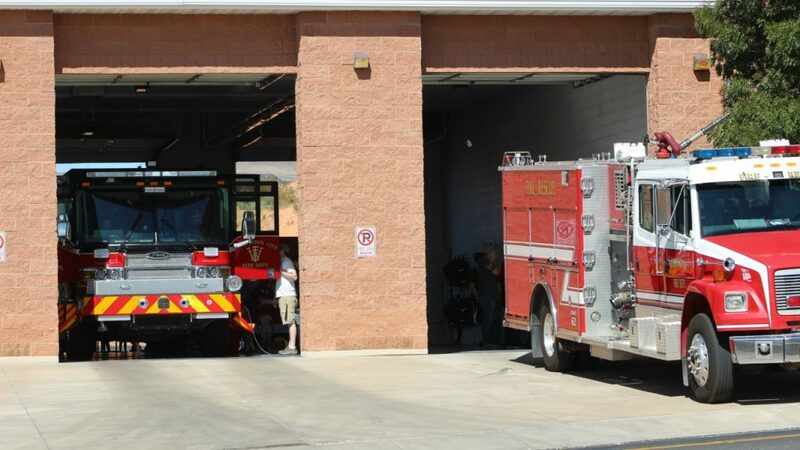 Additionally, the department was using second and third-generation equipment that was made by different manufacturers with varying features, but now the department is using a single set up, which Reyes said will streamline both firefighting and rescue operations. “Our chief and the City Council wants us to have the best tools we can have to do our job,” Reyes added. 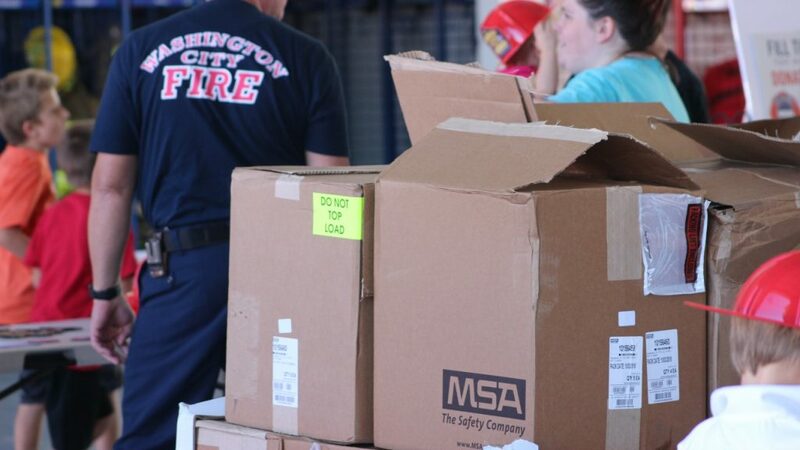 Washington City Fire Captain Mike Harris said Batteries Plus donated a case of 9-volt batteries to stock the fire station and each fire engine to use whenever firefighters are called out to replace the batteries in smoke detectors, a service they perform for free. “We get calls to replace the batteries in smoke detectors routinely, and we’d rather replace them, particularly for the elderly, than they risk falling while trying to do it themselves,” Reyes said. While Saturday’s open house was a first for the department, it certainly won’t be the last, Reyes said.